nice item for the price, got this for my granddaughter. A classic bedroom refresher, this charming quilt set is made of polyester microfiber and features a cozy purple, white, and pink floral pattern. The soft, sturdy stitched padding gives this set a resilient and longlasting plush feel that's sure to provide a chic touch of vibrant charm for years to come. I really love the pattern of these quilts sets that I purchased for my Granddaughters bunk beds! However, the reason I gave them 3 stars was that the quilt sets are Very Very Thin!!!! Its like having two bed sheets sewn and quilted together thats how thin they are! the quilt is very thin and cheaply made. the colors are vibrant. it is also smaller than it should be for a queen bed, I would not purchase this quilt for any reason and will probably donate it. Purchsed this quilt set. It's a little on the thin side for a quilt, definitely need another blanket for colder weather. However, great quality. Sooo soft and wash up great!!! These are very pretty. Colors are vibrant and they washed up great. They are, however, pretty light weight. If your child (ren) sleep cold they'll need an extra blanket or thick sheets. Stiching seems good and straight. My girls' love them! Bought this set for my granddaughters room and I love it. She spilled chocolate ice cream on it so I had to wash it and it came out great. Just like new. The material quality is great for the price. Light weight and colorful for young teen. 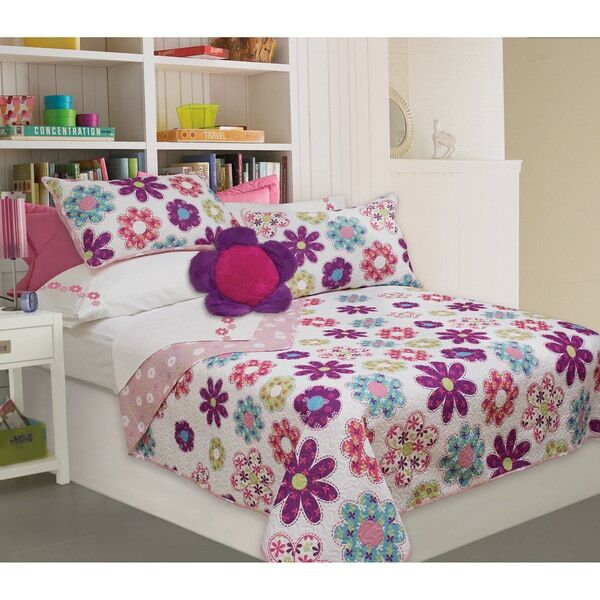 Perfect for girls loft bed!! "I would like to purchase the matching flower pillow, but can't find it in your selection." Unfortunately, we currently do not offer that exact pillow. However, I found that item numbers 16260797 and 21014262 would work well with this set.